Clyde Seaver's life is in shambles. His wife left him and in fear of losing his 2 children he's kidnapped them with the help of his loyal sister, Tina. She has the kids hidden in Becker Swamp and you have to negotiate with the suicidal Clyde and buy your team time to find the kids. 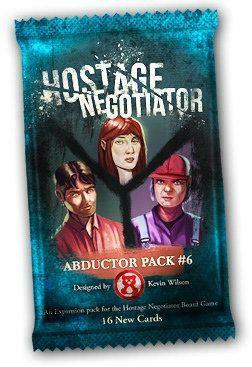 This Abductor pack is a 15 card expansion compatible with both Hostage Negotiator and Hostage Negotiator: Crime Wave.